Does your personality type change how you feel about food? Are you more likely to over-eat or skip meals? I decided to scan all my books to find out if there were any clues related to personality type and food relationships. I’ve compiled all my research into this article, and I hope it will be informative! If you’re curious to know more, check out my sources at the end of this article! Disclaimer: Everyone is an individual with numerous experiences and tastes that shape who they are and their relationship with food. This article can merely point to tendencies in the majority of a type, but not every individual in that type will relate to these descriptions. INFJs tend to have a love/hate relationship with food, and this is largely due to their highly unconscious sensing functions. INFJs tend to be very out of touch with their physical bodies because they have inferior Extraverted Sensing (Se), and also because Introverted Sensing (Si) is their “demon function”. Si gives someone inner-body awareness and because this is the INFJs least-conscious function, INFJs have a very difficult time discerning when they are hungry, full, or accurately reading their body’s cues. Many INFJs report that they don’t realize they are hungry till they start feeling sick or developing headaches. They may forget to eat or drink as they pursue their passions. When INFJs do eat, they usually enjoy a variety of foods and are open to trying new things. Because INFJs have such unconscious Si they may struggle with knowing when they are full, when they need more food, or if they’re thirsty. If an INFJ is distracted they may not even be able to taste their food because their mind is elsewhere. INFJs who rely too heavily on their intuition, or INFJs who are experiencing extreme stress may have an eruption of their inferior Se. When this happens, Se may take over in an immature, unhealthy form. This can result in the INFJ overeating and over-indulging. They may want especially strong flavors to become more in touch with their physical self. INFJs who frequently experience chronic stress may have significant trouble with over-eating and “binging” as a result of so frequently being in the grip of sensing. That said, not all INFJs overeat when they are stressed. You can find out more about their other coping mechanisms here. 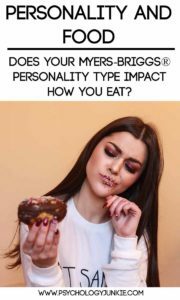 A 2010 study compiled in the paper The Association Between Myers-Briggs Personality Types and Eating Disorders by Sarah A. Williams found that out of a group of 55 patients, the most common type with an eating disorder was the INFJ type. They comprised 18.5% of the patients with eating disorders. Another author, Christine Towne Drucker wrote in Once Upon a Type: Mythological Dimensions of the Myers-Briggs Type Indicator that INFJ types have perfectionistic tendencies which may result in a tendency towards anorexia and bulimia. It is important for INFJs to make sure they are meeting their nutritional needs and that they aren’t being pushed to one extreme of overeating or the opposite extreme of malnourishment. Setting reminders on their phones to drink or eat, following a meal plan, and getting support to maintain healthy habits is especially important for this type. ENFJs enjoy using food as a way to engage socially with others. They often love cooking for their friends or meeting up at a favorite restaurant. The tertiary Extraverted Sensing (Se) of the ENFJ gives them a fondness for fine flavors and adventurous cuisine. They love using food to cheer people up, comfort, and create a celebratory feeling. ENFJs, like other intuitive types, may forget to eat when they are especially absorbed in a project or meeting a goal. However, because their sensing is tertiary they don’t have as much of an issue with this as intuitive-dominant personalities. ENFJs who rely too heavily on their extraverted functions (Fe and Se) can struggle with over-eating because they see eating as a social obligation and have difficulty turning down treats and food at parties or gatherings. Other ENFJs may struggle with serving other people the best and only getting the “leftovers”, which essentially means they are so concerned with providing healthy meals for their families and good food for their friends, that they lose track of their own nutritional needs. They may snack throughout the day or get so busy taking care of others and feeding them that they forget to feed themselves. It’s important for ENFJs to put their needs first when it comes to their health and making sure they get adequate nutrition. INFPs have tertiary Introverted Sensing (Si) which gives them a certain awareness of their body’s signals, however it is also not well-developed (usually) until mid-life. This results in many young INFPs struggling with an awareness of their own hunger or thirst. They may become absorbed in an activity or thought and lose track of time, skipping meals or becoming dehydrated. Overall, INFPs are not especially food-oriented although there are variations from individual to individual. Many INFPs like foods that they’ve come to enjoy again and again through habit, and this is a result of their tertiary Si. They tend to be picky eaters as young children. ISFPs who mistype as INFPs (which is relatively common) may be much more adventurous with new tastes. The majority of INFPs prefer to eat alone or with a few close friends as opposed to eating at large gatherings or parties. Isolation gives the INFP the ability to relax and truly enjoy the flavors and sensations of the food they eat. ENFPs love the social aspect of sharing a meal with others. They love meeting up at restaurants or coffee shops and discussing their latest ideas over a favorite dish. However, on their own ENFPs aren’t especially aware of their body’s signals. This is because ENFPs have inferior Introverted Sensing (Si). When ENFPs are caught up in an idea or possibility they may forget to eat for long periods of time. When I was taking the MBTI® Practitioners Course, the instructor (an ENFP) spoke about this in detail. He explained that whenever he got caught up in ideas and over-used his dominant intuition that over time he would realize he wasn’t feeling well. Suddenly it would occur to him that he hadn’t eaten in days! This kind of experience is relatively typical for intuitive-dominant personalities. When ENFPs are experiencing chronic stress or they have over-used their dominant intuition, they may experience a “grip” reaction. When this occurs, their inferior Si takes over, often in an unhealthy way. They may eat more than usual, but it is more common for ENFPs to exhibit inferior Si in other ways; they may become obsessed with organizing or cleaning or filing things away. They may also become hyper-aware of inner-body sensations and start worrying that they have a life-threatening illness. It’s important for ENFPs to remember to eat and drink. I’ve spoken to some ENFPs who set reminders on their phone to get a glass of water or a healthy snack throughout the day. ENFPs are less likely to skip meals if they have something readily available to grab and eat without much preparation or distraction from their visions. INTJs can go from ignoring food for long periods of time to being the most adventurous epicureans. Because they have inferior Extraverted Sensing (Se) they tend to be unaware of their body’s hunger cues. Their Introverted Sensing (Si) is the least conscious of all their functions, or what typologists would call the “demon” function. Because Si gives the user an awareness of inner-body sensations like hunger or thirst, those with Si in their shadow functions may be unaware of when they are hungry, when they are full, or when they are thirsty. Many INTJs report that they don’t realize they are hungry till they start feeling sick or developing headaches. They may forget to eat or drink as they pursue their vision or plan for the future. When INTJs do eat, they usually enjoy a variety of foods and are happy to try new things. If they are focused on a goal or a project, they may not even be able to taste their food because their mind is elsewhere. When INTJs have a grip-related stress reaction, Se takes over in an immature, unhealthy form. The INTJ who normally is focused on moderation and a big-picture vision may suddenly become impulsive and reckless. They may binge eat, or else deny food altogether. They may crave especially strong flavors to become more in touch with their physical bodies. You can find out more about their other coping mechanisms here. A 2010 study compiled in the book The Association Between Myers-Briggs Personality Types and Eating Disorders by Sarah A. Williams found that out of a group of 55 patients, the second-most common type with an eating disorder was the INTJ type. They comprised 10.63% of the patients with eating disorders. INTJs are very perfectionistic individuals and it is believed that this might contribute to their focus on weight and size. It is important for INTJs to make sure they are meeting their nutritional needs and that they aren’t being pushed to one extreme of overeating or the opposite extreme of malnourishment. Setting reminders on their phones to drink or eat, following a meal plan, and having plenty of healthy food readily available is especially important for this type. Note: Many ISTJs mistype as INTJs from online personality tests. ISTJs are very aware of inner-body sensation because they have dominant Si. They can usually tell pretty quickly when they are hungry or full and they tend to have favorite foods that they come back to again and again. INTJs, in contrast, tend to be very unaware of their body’s hunger cues and when they do eat are less likely to have the same things again and again. ENTJs are very goal-oriented individuals who can get lost in their vision and forget to eat enough or stay hydrated. When ENTJs are in pursuit of their vision they may suppress their tertiary Extraverted Sensing (Se) and focus entirely on their plan for the future. However, when that goal is completed they often enjoy celebrating with a lavish meal or favorite drink. ENTJs tend to enjoy rich, flavorful foods and there is usually nothing new they aren’t open to trying. Because Se is the ENTJ’s relief function, they can make a hobby out of trying new and decadent flavors. ENTJs aren’t usually picky eaters, and they are likely to be very logical about what they eat. If they eat too much they are usually pretty good about exercising to stay fit. In fact, according to the MBTI Manual, the favorite leisure activity for ENTJs is exercise. While ENTJs truly appreciate a delicious, exciting meal, they tend to not make a habit out of overeating or “binging”. INTPs tend to immerse themselves in their thoughts and hobbies and they may see mealtimes as an unwelcome interruption. Because INTPs have tertiary Introverted Sensing (Si) they tend to have favorite meals that they come back to again and again when they are in a relaxed state of mind. For the most part, INTPs try to find the quickest, easiest meals that they can put together without having to spend a lot of time at it. INTPs usually have a good sense of when they are full, and are less likely than many types to have issues with overeating. Certain INTPs enjoy using their Ne as a way to experiment with different unique foods and flavors to create their own signature dishes. However, this is less common with this type than with others. ENTPs enjoy the social aspect of sharing a favorite meal with friends. Because they have inferior Introverted Sensing (Si) they can struggle with being aware of their body’s hunger cues. They may get caught up in thoughts or ideas and forget to eat or drink as they pursue new possibilities. This period of unawareness may go on for several days until they start realizing they feel sick, dizzy, or especially lethargic. Intuitive dominant personalities, in general, are most likely to be unaware of their body’s hunger cues and go for periods without eating. When ENTPs ignore their inferior Si for long, this may result in a Si-eruption. When this happens, the ENTP may become especially focused on food and indulging in their favorite meals. More often, though, ENTPs in the grip of Si become uncharacteristically quiet, withdrawn, and in extreme cases they may become especially aware of inner body sensations and become concerned they are suffering from a life-threatening illness. It is especially important for ENTPs to have reminders to eat healthy meals and snacks throughout the day so they can avoid malnourishment or side-effects. ISTJs are usually very diligent about maintaining mealtimes and they usually have a variety of favorite foods they come back to again and again. Because they are Si-dominant they can usually tell when they are hungry, full, thirsty, or hydrated. They tend to take care of their body’s needs and are unlikely to lose track of mealtimes. ISTJs are usually very aware of flavors and as a result may be sensitive to especially strong or spicy foods, unless they were raised eating such types of foods regularly. ISTJs are very habit-oriented with food; they like what they know and tend to not be as adventurous in their palettes as Se-users (SP or NJ types). Most ISTJs aren’t prone to overeating because they determine when they are full much better than most other types. However, unhealthy ISTJs who focus too extensively on inner-body sensations and flavors may become overly indulgent with food and develop an excessive love of food or drink. ISTJs who grow up in unhealthy environments may get into a habit of unhealthy eating and it can be especially hard for them to break this habit because the more they do something the more it becomes enjoyable to them. ESTJs are such task-oriented people that they often see mealtimes as another item to check off their to-do list. They usually eat at the same times every day and enjoy a variety of meals that they come back to again and again. Their auxiliary Introverted Sensing (Si) makes them especially aware of flavors and they may be sensitive to especially spicy or strong flavors, unless they were raised eating these types of foods. ESTJs tend to be picky eaters as children and they may prefer to stick to a few favorite meals. ESTJs who are experiencing a grip reaction to stress may handle anger or frustration by overeating or indulging in some other way, but this varies from person to person. ISFJs are similar to ISTJs in their relationship with food. They are usually diligent at maintaining meal times and they often have a selection of favorite foods they come back to again and again. Because their dominant function is Introverted Sensing (Si) they are usually aware of their body’s hunger cues and are less likely to skip meals or forget to eat or drink. They may be picky eaters as children, carefully avoiding new and unfamiliar foods or being wary of strong or spicy flavors. ISFJs who are raised on strong or spicy food will usually be more adventurous in their tastes and less likely to be satisfied with bland meals. The more ISFJs are used to eating a certain meal or type of food, the more likely they are to enjoy that same meal into adulthood. Because ISFJs have auxiliary Extraverted Feeling (Fe) they may use food as a way to reach out to their friends and family and show they care. Many ISFJs enjoy creating delicious meals for their loved ones or helping out in their communities and organizations by contributing to bake sales, soup kitchens, etc,. They may have a difficult time turning down food at a social gathering for fear of being rude to their host or hostess. Most ISFJs are aware enough of when they are full that they don’t overeat as a habit. Some ISFJs who are imbalanced or immature in their growth may focus too heavily on Si and develop an excessive love of food or drink, but this is rare. ESFJs enjoy the social opportunities that food can provide. They are usually very good hosts or hostesses, providing delicious meals for their friends and loved ones. They use food as a way to reach out to people and take care of them. If someone is sick they are likely to show up with a hot meal at their doorstep, if someone is sad they may bake them a batch of cookies. Obviously, every person varies, but as a general trend ESFJs enjoy using food as a way to reach out to other people and show they care. They are more attached to the idea behind the food than the food itself. ESFJs are usually aware of their own hunger cues and tend to eat at the same times every day. They often enjoy a selection of favorite foods that they come back to again and again. ESFJs have been known to overeat when they are worried or stressed, but if they are in a balanced state they are not prone to over-eating. ISTPs who enjoy good use of their auxiliary Extraverted Sensing (Se) tend to be true connoisseurs of good food. They enjoy fine flavors and are adventurous in their palettes. Some ISTPs see eating as a simply utilitarian function, and eat merely because they have to. But most ISTPs know how to relish each bite and enjoy new and different varieties of cuisine. ISTPs have no problem saying no to unwanted food at a social gathering, so social overeating is less likely to be a problem. They are fond of trying new things, and aren’t as concerned with eating at the same time each day or having the same food at every meal. Their Se gives them a stronger desire to try new and novel treats and high-quality delicacies. ESTPs relish new and exciting flavors and they tend to be adventurous food connoisseurs. Their dominant Extraverted Sensing (Se) gives them a love of flavorful, decadent cuisine. They are willing to try just about anything and they can grow especially fond of sweets and fun snack foods that are rich and tasty. Many ESTPs like to snack when they’re bored to keep their Se stimulated, but others may listen to music, exercise, or do something hands-on and creative to engage their Se. Novel foods and tastes are exciting for ESTPs. They are less likely than Si-users to notice when they are full or hungry and they may overeat and not realize they are full till they develop a stomach ache. That said, ESTPs are generally very active and physically oriented so they tend to burn off a lot of calories and avoid a sedentary lifestyle. They also tend to care about their appearance and takes steps to ensure they are healthy and physically fit. Many ESTPs make excellent chefs because of their natural creativity and knack for experimenting with unique blends and exotic spices. ISFPs enjoy experimenting with flavors and tastes and many of them can be very creative chefs. Their auxiliary Extraverted Sensing gives them a love of rich, fine flavors and sweet treats. ISFPs tend to be adventurous epicureans and are usually open to trying new, exciting dishes. That said, they also tend to be physically active and concerned with staying in shape, so they may exercise self-control and restraint more often than other types when they eat. ISFPs, as well as all other Se-users, can fall into the trap of eating when they’re bored, but they may also have healthier outlets like drawing, listening to music, exercising, or reading. ESFPs enjoy the celebratory aspect of eating. They love to gather at a favorite restaurant with friends, or try new and exciting dishes from around the world. They tend to be natural foodies, since new flavors and tastes stimulate their dominant Extraverted Sensing (Se). Se-users tend to be active and concerned with their physical appearance, so they often try to keep an eye on what they eat and avoid overeating. That said, ESFPs who focus too much on stimulating their Se at the expense of their other functions may binge eat, watch too much TV, or find other sensory stimulations to indulge in. Because ESFPs do not have Introverted Sensing (Si) in their primary function stack they may struggle with discerning when they are full. They may also get wrapped up in an activity and forget to eat. It’s important for them to take the time to slow down while they eat and notice their body’s signals. ESFPs can make excellent, creative chefs and can enjoy experimenting with different exotic herbs and spices to create one-of-a-kind dishes for friends and family. In fact, chef Jamie Oliver is believed to be an ESFP. What Are Your Thoughts? Do you relate to this article? Do you think your type impacts how you eat? Let me know in the comments! However, as an ENFP growing up in an Italian/English family, food has been an important aspect to my culture. While sometimes eating may seem like a bother, the majority of time food is quite important to my day. I rarely struggle with eating unhealthy food, as I have grown up attracted to tasty, but also nutritious food groups. Perhaps, I am an anomaly when it comes to ENFP’s? I’m an ENFJ, and I identify with a lot of what was said here, but I don’t get out much, being in high school. Extra note, I eat very messily, not really related with my personality, but it does gross a lot of people out. I am an ENFP and i struggle with not eating every day! You phrased the ENFP section perfectly. Wow! Thank you so much! Good luck remembering to eat! As an INFJ I can relate to the tendency – inferior sensing can make practical self-care difficult! Hi I am new to your blog and I really like it here a lot. (ENFP) That is really interesting. Over the past few weeks… maybe years… I’ve had days where I was so caught up in some work or some other thing that I didn’t even notice I hadn’t eaten all day until later in the evening. I realized very recently that it was happening and I had no idea that my MBTI type had anything to do with it! WhenI read the title of this article I thought you were going to say ENFPs loved to be adventurous with their food choices or loved to eat spicy food (I really love to eat spicy food!). I had no idea it would touch on this sort of thing! Wow. That was incredibly insightful. Good stuff Susan! Very interesting. I never came across an article before that covered this angle of things. I am INFP and was definitely a picky eater as a child but am quite the opposite now. It’s also true that I can forget to eat or eat on a funny schedule if I am preoccupied with a project. At my former job, a coworker had to remind me to eat an earlier lunch, as I was getting stomach aches.